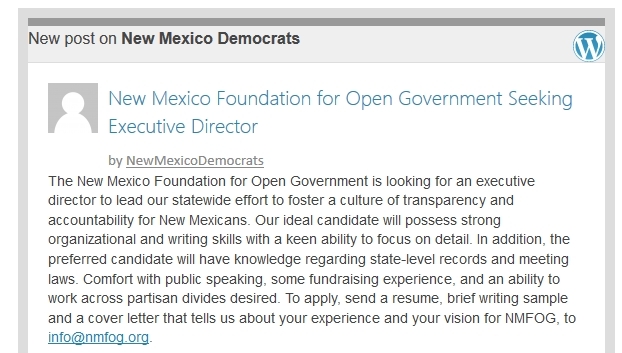 The New Mexico Foundation for Open Government is looking for an executive director to lead our statewide effort to foster a culture of transparency and accountability for New Mexicans. Our ideal candidate will possess strong organizational and writing skills with a keen ability to focus on detail. In addition, the preferred candidate will have knowledge regarding state-level records and meeting laws. Comfort with public speaking, some fundraising experience, and an ability to work across partisan divides desired. To apply, send a resume, brief writing sample and a cover letter that tells us about your experience and your vision for NMFOG, to info@nmfog.org. Applications will be accepted until 5:00 PM Oct 18, 2013. Salary: $45,000 – $50,000, with health insurance stipend. NM Foundation for Open Government Website. Click here. What’s up? Did one of the interns responsible for sending out those misspelled tweets I mentioned this summer get sent to the blogging department of DPNM? Or was this post deleted purposely? You can learn more about current executive director of the New Mexico foundation for Open Government and his close ties to the Left as well as support for Democrat causes here. Is Mr. Schleder about to move on to something that fits his ideology better? Have a tip on what’s going on? Email me here, send me a Facebook message, or send me a tweet.